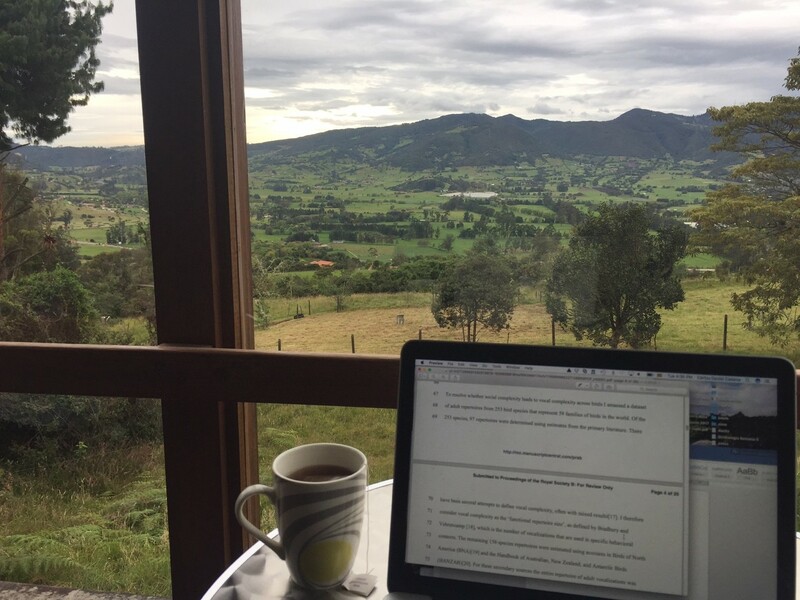 This week, I’m interviewing Carlos Daniel Cadena, Professor at Universidad de los Andes in Colombia. 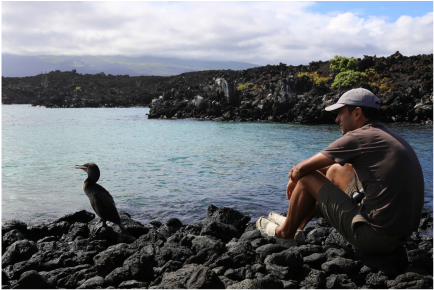 Daniel’s work cuts across a broad swath of evolution and ecology, but mostly focuses on the evolution and systematics of neotropical birds. I asked him how he gets it done. Current mobile device(s): iPhone 6. Broadly speaking, I am interested in and work on evolutionary biology of birds and (occasionally) other vertebrates. Over the years, I have worked on a broad range of topics, from genetics, physiology and behavior all the way up to diversification and broad-scale patterns of diversity, with a little bit of everything in between. I am most interested in questions in biogeography and I am especially intrigued about the causes of high tropical diversity at various levels. I like to pursue my interests in tropical diversity from a wide variety of perspectives combining field, lab, museum, and computational work. My approach to running a lab has been rather different to that of many other researchers in our field. When I first landed my faculty job I often wondered whether I should focus on a single study system in which to address questions at great depth from multiple perspectives and really get to know the system in detail, or rather pursue my curiosity (and allow for student freedom in developing their independent projects) by spreading out quite thinly working on multiple topics and various systems at the same time, moving on from one project/system to the next after learning a few things. I somehow ended up picking the latter option and although I sometimes suffer of the “impostor syndrome” by thinking that much the specifics of my work are rather superficial relative to careful in-depth work done by many colleagues, I believe that knowing relatively little about many different things has been a great career path, if only to maintain my excitement with regards to answering new questions and learning new things. I say all this only to explain why I believe a strategy that has worked for me is to be open and flexible, and willing to learn from students and colleagues. This has allowed me to mentor a great diversity of students and to collaborate with colleagues with various interests and backgrounds. I also think that being in a lab where people might be working on a bunch of (seemingly) unrelated topics is especially valuable for graduate students, who I think should be exposed to a broad spectrum of ideas and tools. I like to think my students will appreciate my somewhat eclectic approach in the long run. Honestly, I am not a big data cruncher these days. Because I have had a rather heavy teaching and administrative burden, over the past few years much of the research I have done has been conducted by supervising students, and it’s really them doing the hard–and fun–work. For the few projects I am currently analyzing data myself, I mostly use my personal computer. In terms of where do I physically work, now that I am relatively free of meetings, etc., I have been exploring working in various places aside from my office including other spots on campus, cafes, and at home. I recently rented a house out in the country outside of the city and working there has been especially fun and productive. I guess the views help. It’s not really a gadget, but I rely heavily on Slack for communication with members of my team. When I was department chair, my email was total chaos and important and fun things would often get lost, so I basically abolished communication via email with my students and lab associates. Slack allows me to respond quickly and to have all the important communications related to people and projects in the lab properly organized. What part of your job do you spend the most time on in a week? What part do you wish you had more time for? Teaching, including preparing and giving lectures, but also reading even if my readings do not immediately get incorporated into classes. Although it is increasingly hard to keep up with the literature, I believe that you really need to know where various fields are going in order to be a good educator. Like almost everyone else, I would like to have more time for research and especially to think about long-term research plans. However, I should say that I was on sabbatical leave recently and while I honestly did not miss teaching a whole lot while I was away, getting back to my classes has been quite enjoyable; I like teaching a lot. I don’t know! I hardly ever write down a to-do list (except when things are getting out of control) and I don’t use a calendar to schedule appointments, etc.. This is probably not good advice for many people, but I guess I (sort of) remember the important things I need to do and they somehow get done. Well, most of the time. Definitively, sports are my escape valve. I started running more than six years ago and very quickly got really into it and became a long-distance runner. I’ve run nine marathons so far and train very hard for this with a team, typically 5-6 days a week. I also picked up road cycling a little over a year ago and have already done a couple of century-mile events. More recently, I started swimming and a few weeks ago completed my first short triathlon; I am now training for my first long-distance event. It will take time, but I think I will end up running ultramarathons and likely ironman triathlons, that’s the kind of person I am. Some people say they have great ideas for work while running or cycling, but I hardly ever think about work while training. This is my time to get totally disconnected from work and I think this gives me great energy to get me through the day and work effectively. I recently gave what I thought was a quite smooth lecture on a relatively difficult topic at 9 am; my students probably did not notice my day had started very early and I had already run 30 km before showing up to class. Research manuscripts and thesis drafts! Also, I am little-by-little reading Andrea Wulf’s “The Invention of Nature” on Alexander von Humboldt’s fascinating story. I’m definitively a morning person. I usually go to bed quite early and wake up very early to train. Some of my triathlete friends think I am too much of a wimp because I am not willing to wake up at 3 am to go for a long bike ride, but I am fine with starting my day at 4:30 am to go swim, ride, or run. Bob Ricklefs. I had the fortune to work with him, but I still do not get how he does it all. Thanks Daniel! Next week: Dr. Kathryn Hodgins…..